The All Night Strut shows at the SLO Repertory Theatre through Sept. 17. Tickets range from $20 to $38. Martinis will be available at the bar for matinee and evening shows on Sept. 2, 9, and 16. Upcoming main stage productions for the show's current season include Rabbit Hole, Rounding Third, The 39 Steps, Lost In Yonkers, and Annie. Visit slorep.org for more information. Sometimes, you just want to celebrate, make some noise. 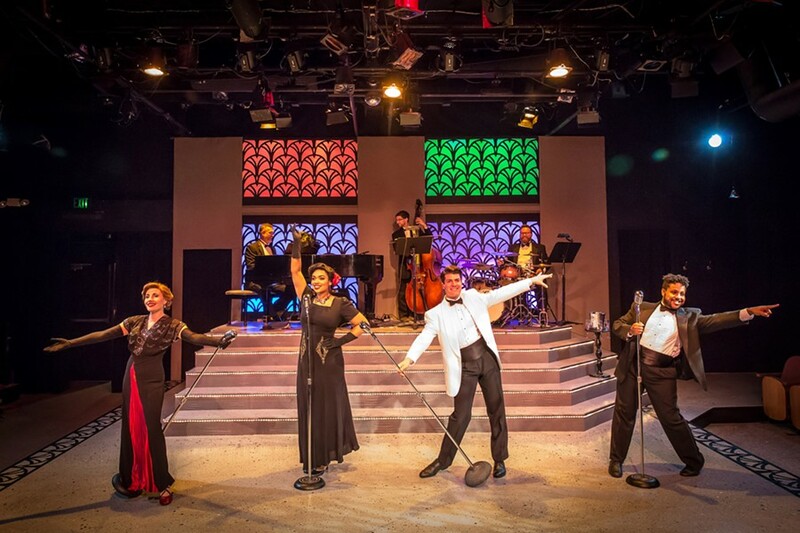 It was a perfectly fitting way to feel on opening night of the musical revue, The All Night Strut, Aug. 25 at the newly renamed San Luis Obispo Repertory Theatre. RHYTHM AND BLUES Keenon Hooks, Méami Maszewski, Katie Worley-Beck, and Timothy Stewart star in SLO Repertory's rendition of the musical revue, The All Night Strut. The night marked the launch of its 71st theatrical season and its first show as a nonprofit professional theater after 70 seasons of producing shows as the former SLO Little Theatre, a community theater with roots going back to 1947. The theater went public about the changes in May and is now paying all casts and crews for main stage productions. Audiences can expect to see new faces on stage with theater credits from near and far, like the cast of The All Night Strut, which includes PCPA alum Katie Worley-Beck (Oregon Cabaret Theatre, The Great American Melodrama), Keenon Hooks (Oregon Cabaret Theatre, PCPA), Méami Maszewski (PCPA), and Timothy Stewart (PCPA, The Great American Melodrama). This charming quartet is directed by Michael Jenkinson (PCPA, Oregon Cabaret Theatre) in a show that is joyously nostalgic. The set is simple, starting out in a train station, implied only by the suitcases the actors sit on and the song choice before gradually transitioning as the show goes on to a swinging nightclub, aka "The Strut Club," with the performers donning snazzy suits and full-length gowns. The All Night Strut has very little dialogue and no narrative thread or plot to speak of. 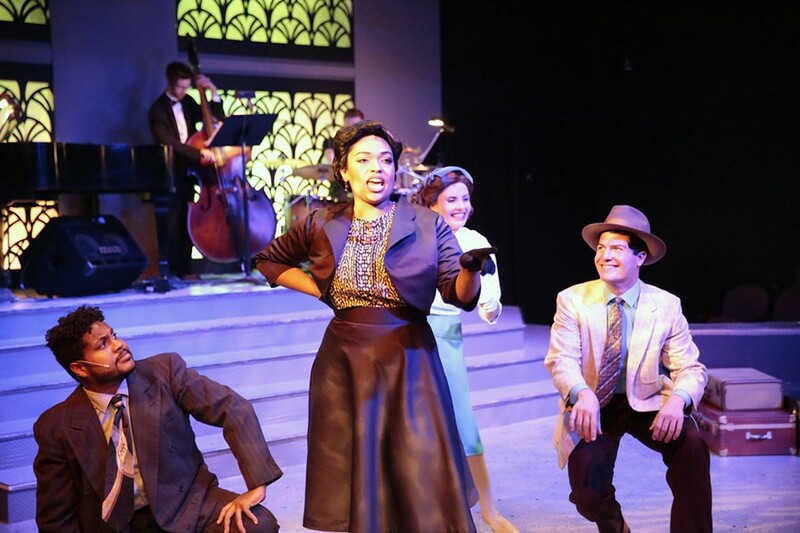 Instead, the show takes you back to the funky jive of Harlem and the romance of the Stage Door Canteen in the 1930s and '40s through songs like "Minnie The Moocher," "In The Mood," "Fascinatin' Rhythm," "I'll Be Seeing You," "It Don't Mean a Thing if it Ain't Got That Swing," and "As Time Goes By," all of which are pulled off with impressive vocal range by Worley-Beck, Hooks, Maszewski, and Stewart. TAKE ME BACK A night at SLO Rep's "Strut Club" feels like an evening straight out of the 1930s or '40s with the musical talents of Katie Worley-Beck, Méami Maszewski, Timothy Stewart, and Keenon Hooks setting the mood. There's a good amount of witty banter to gently segue the audience from song to song, and the actors are certainly in character, though they all go by their given first names on stage. What really makes The All Night Strut work and hold viewers captive is is the live band, a trio that features piano, bass, and drums. Arts Editor Ryah Cooley is jumping and jiving away at rcooley@newtimesslo.com.